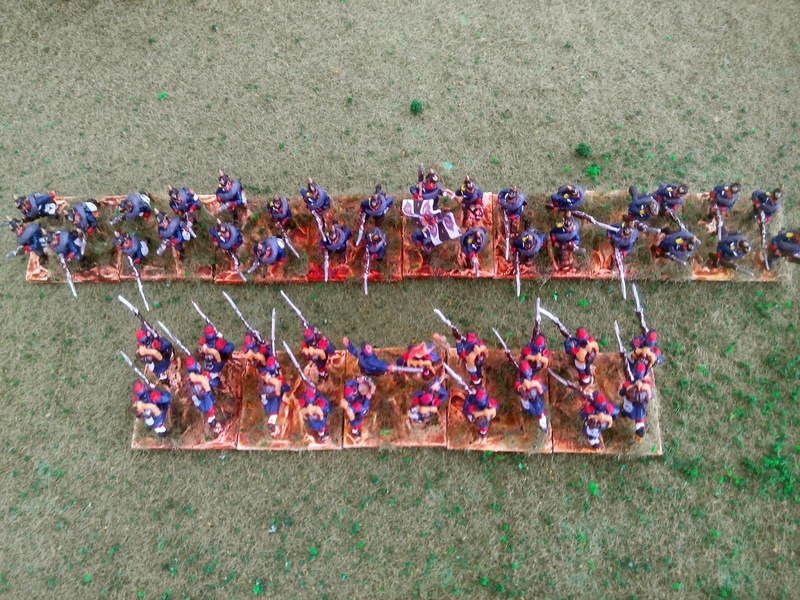 Here is a Prussian battalion painted up as a trial. They were about 1000 men strong so they often operated tactically in half battalions (two companies) so I have shown them in two distinct lines. The bottom picture shows the size difference between a French and Prussian battalion. I'm still not sure whether I will do this in 15mm. Do I have the stamina? Both Prussians and French look terrific! I say, forge ahead in 15mm. Looking great so far. You can do it! 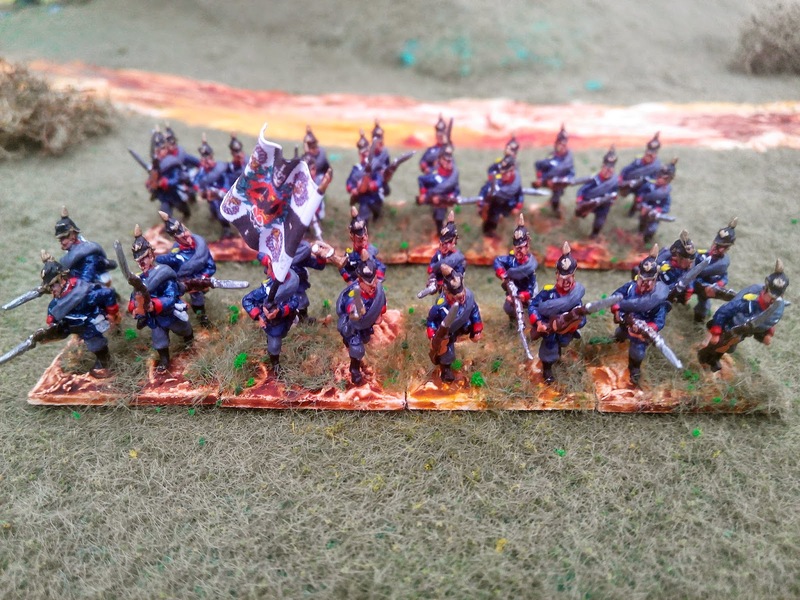 10mm, or even 6mm, are viable options for these larger, late 19th century wars. 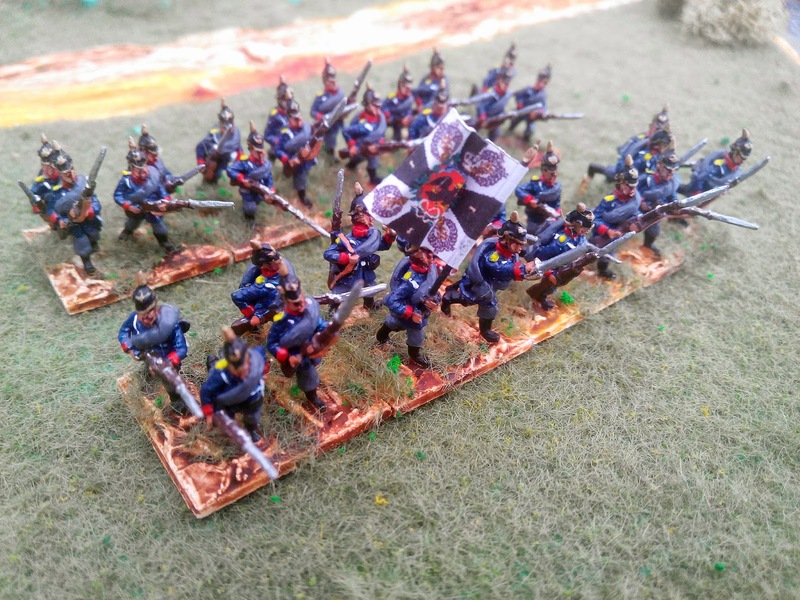 Many years ago, there was an article in an early issue of Wargames Illustrated from 1987, or early '88, that featured a photograph of two of Peter Dennis' 6mm Ros & Heroics Franco-Prussian set-up, and it looked great. While I've never gone that small, from what I have heard/read, it's fairly easy to churn out acceptable looking units at that size in fairly short order. Food or thought anyway. Thank you guys for your encouragement!! Nigel, keep up the good work. I'm sure the smaller scales do have their advantages, but I'm hooked on 15mm myself. The price is still reasonable (esp. with OG15s large-figure discount). And, it's got just enough detail that you can have fun with varying the figures and poses on each stand. I even like to turn the heads in different directions to get more variety. Another variation is that I will detach blanket rolls from knapsacks and glue them on to other figures who don't have them (at least you can do this with the Austrians).